Every now and then a software company emerges out of the cracks of cyber space to completely take our breath away, and Thunderkick is the latest of those relatively unknown brands that is spreading fast across the online casino world. The young Stockholm based gaming company produces all of its games in-house with a small team of devoted gaming enthusiasts. The developers love for what they do shines in each of the brands impressive games and it’s evident that they’re nailing the company mission to focus on quality over quantity. The portfolio of Thunderkick games is small, but the level of detail that goes into each one means you can play the same rotation of games for hours on end without ever tiring of them. Thunderkick titles have recently started to appear at some of our favourite online casinos like Guts.com and SlotsMillion.com and we expect to see them popping up all over the place as the popularity of these quirky games rises. Esqueleto Explosivo – this has to be among the most charming pokies you’ll find anywhere on the Internet and is the greatest example of the distinct Thunderkick game style. Esqueleto Explosivo follows the amusingly quirky Enrico Mortis and The Boners, a mariachi band of skulls celebrating the Mexican festival, Day of the Dead. A must play with your speakers on, as the soundtrack and sound effects would make this game such a joy to play even if winning money wasn’t on the cards. 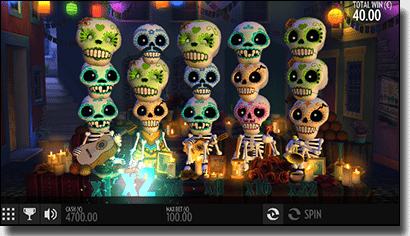 Sunny Scoops – we challenge you to find a slot game that uses a format similar to Sunny Scoops as this game is just so unique. It’s a 3 x 3 pokies consisting of three sumptuous looking ice creams melting in the summer sun and instead of symbols spinning on the reels, delicious scoops of ice cream fall down on top of the ice cream cones. 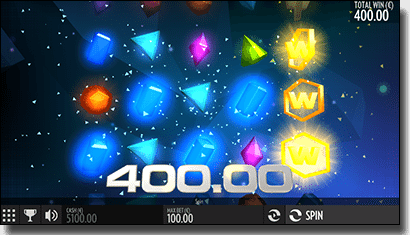 Sunny Scoops has seven crazy bonus games including a sweet free spins feature. Bork the Berserker – another game of a different kind, Bork the Berserker is as kooky as the name suggests. This 25 payline slot game follows the crazy character of Bork on his quest to save his girlfriend from The Evil Sorcerer, a difficult feat considering the Sorcerer has sent out a bunch of his minion monsters to get in Bork’s way. A definite hit for fans of quirky, creepy cartoon characters. Flux – if you’re looking for a pokies game on the tranquil side, Flux just may be for you. 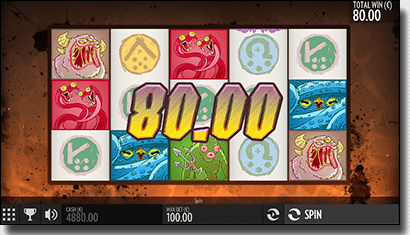 The 15 payline game features a river of enchanting crystals, flowing majestically across the reels in a very captivating fashion. The colours are very serene while three bonus games keep the excitement pumping. Flux is a simple game with an engaging twist, capturing the true Thunderkick magic. Slots Million – Slots Million has a smorgasbord of online pokies from over 20 of the industry’s leading software developers and you’ll find Thunderkick titles amongst games from huge brands like Microgaming and Net Entertainment. Quick to load in browser mode with no downloads required, you can play Thunderkick games here for free or real money bets. Guts Casino – Thunderkick games recently made their debut at Guts.com and we couldn’t be more thrilled as Guts is one of our favourite online casinos, not just for slots but for blackjack, roulette, video poker and live dealer games. Sign up at Guts to keep in the loop of the incredible promotions for new and loyal players. Each of these sites support deposits in multiple currencies and are protected by SSL (Secure Socket Layer) encryption technology, allowing players to place bets knowing their privacy is protected. Jump on the Thunderkick band wagon today as this software company is bound to break some serious ground in the online casino industry.